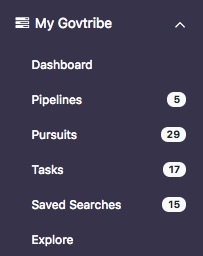 At any time, you can view and access your Saved Searches via the Saved Searches menu item under My GovTribe in your side menu. If you choose to View your Saved Search, you will be taken to the associated search page on GovTribe with the search parameters for that search already set. There will be a status bar at the top of the page indicating that you are viewing one of your saved searches. If you change any search parameters (i.e. adding or removing filters, adding a keyword search, etc.) The status bar will ask you if you want to save your changes for that Saved Search. Click the "Save Changes" button to save your changes to the same Saved Search. If you wish to save the updated search query as a new Saved Search, click the "Close" button on the Saved Search status bar as pictured above. All of your search parameters will remain, but you will now be able to save a new search using the same approach as is described in our article Setting Up a Saved Search.